By stefanos on Thursday, October 1st, 2015 in Area Guides. This guide offers a comprehensive overview of the area in East London known as Poplar. We are going to take a look at the different places to visit in and around Poplar; the best places to eat, the architecture of the area and the different transport means available to get to Poplar and make your way around the area. Mostly viewed as a historical residential area, it is unsurprising to find that the architecture in the area contains homes that were constructed and built in both the 18th and 19th centuries. This is not to say new homes haven’t been built, council estates built in the 20th century can be seen on almost every street. Poplar suffered much damage to its buildings and surroundings during World War I. It was particularly targeted by the German Zeppelins which saw hundreds of people loose their lives during the course of this war. World War II brought its own scourge to the little metropolitan area. Today however all associations with the two wars have been covered up and the damage repaired. Situated in East London, England; the area known as Poplar has been home to some very famous people such as former Arsenal FC coach Neil Banfield, Angela Lansbury and author Jennifer Worth. Buying property in Poplar is a great investment and one that can become very rewarding down the years as the housing market in London almost always enjoys significant growth spurts every year. Warehouses that were in the area have been converted into state-of-the-art office facilities and this has led to the recent surge in the infiltration of major companies such as BP and HSBC. Whether you are in the market for office space or apartments to buy or flats to rent Poplar has some really great options for you. There are quite a lot of contemporary buildings around thanks to the major corporations who have decided to take up residence in the shadows of the pristine area. Given that the area is well known for being an historical site, you will also discover that the buildings in Poplar are a mixed bag of 18th, 19th, 20th as well as 21st century architectural erections. 21st century buildings of note that have been erected in Poplar include the Church Green that came into being in 2012 as a replacement of the Catholic Church that once stood on the same site. Other structures that have been erected around the church include an impressive 15 foot Cross that stands on the site of the former high altar. The contemporary sculpture known as ‘A Doorway of Hope’ can also be seen around this church area. Architects Alison & Peter Smithson are responsible for the idyllic Robin Hood Gardens housing complex in Poplar. Other buildings you might find interesting are Glenkerry House and Carradale House. Poplar is notorious for its residential skyscrapers that soar tens of floors into the air. Whether day or night, winter or summer, Poplar residents and visitors are able to take part in a variety of activities all year round such as enjoying the Museum of London Docklands which is only found less than a mile away from Poplar, or enjoy the great outdoors with a visit to the Surrey Docks Farm. There is always plenty to see and do in and around Poplar. 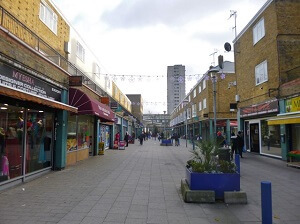 If you are interested in a tour of Poplar but not quite sure where to start off from then a good place to start would be Chrisp Street Market. The exuberant and highly popular market is the district centre and is seen as one of the hubs of activity for the area. It is the first ever set apart pedestrian shopping platform in the UK. If you have little ones around the house then you might be looking for great places to take the kids to. Why not try the Wild Kingdom Play space which is less than a mile from Poplar. You can also opt to go to the Museum of Childhood found in Bethnal Greens just 2 miles out of Poplar. The London Aquatic Centre which is also just 2 miles from Poplar is a great place to visit and let the kids ooh and aahh over the different kinds of fish and other sea creatures they will see. History enthusiasts will have a ball as they walk through the well maintained streets of Poplar. Poplar High Street makes a great place to visit as there one can see the famous St Matthias Old Church which sits alongside Poplar Town Hall – two very distinct structures that will interest art lovers and architects alike. If you are into mosaic art then you will surely find the Town Hall’s mosaic details quite intriguing. St Matthias Old Church was constructed by the East India Company in the 17th century, 1654 to be exact. The architecture of the chapel resembles Dutch chapels and has been likened to some of the work done by architect Hendrick de Keyser. The church’s roof is barrel vaulted and has eight Tuscan columns bearing it up and supporting it, of which seven are made of oak and the last one is made of wood. You cannot possibly make a complete tour without making a stop by the Poplar Bowls Club. Make a day out of it and enjoy the great outdoors with friends and family or your dog as you take in the sights of the Poplar Recreation Ground. The ambiance and atmosphere of this place has been described by some as giving off the air of a sacred place. Poplar Bowls Club got its start way back in 1910. It is a place that welcomes old and young, it is a club that has become more than just a social gathering place for many. Poplar Bowls Club has won numerous county awards over the years. If you are looking for a place to meet people and make new friends, this is a good place to start. The Workhouse is a sports centre that was opened not too long ago and is already a hit with those who live in the area. It’s a fantastic place to have a game with the boys or just a tussle with the kids. Discover sports you never knew about and try some you never stopped to learn before until now. Enjoy the experience of Poplar’s sports club. Situated along Poplar High Street, the Workhouse isn’t just a sports centre but combines both community and leisure activities into one central place. It is a profitable resource centre for one and all. The Workhouse is open Monday to Friday from 10am to 4pm and is closed on Saturday and Sunday. There are several council estates of note to keep an eye out for and buildings that you may find interesting. On the list is Will Crooks which is a council housing estate named after the British politician of the same name. Balfron Tower, Glenkerry House as well as the Poplar Baths make great places to visit as well. If you want to see one of the largest public housing estates in London then you must see Lansbury. Lansbury Estate is a council housing estate that was erected in 1951 as part of the Festival of Britain. It is this estate that contains Chrisp Street Market. The area on which Lansbury estate was built on had been damaged severely by World War II bombings. 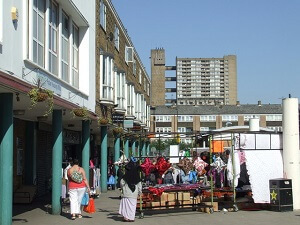 In 1949 construction work began on Lansbury as well as Chrisp Street Market. The entire project was completed in 1982 with the houses found along Pigott Street. The Museum of Docklands is a must see for everyone. Museums don’t have to be boring as you will discover when you go to this museum which bears interesting artefacts and collections of intriguing articles from pre-historic times. If you have children this makes for a perfect day out as they will be fascinated by what they will see. Mudchute Park & Farm is a favoured place for families to spend the day at. If you love all things fluffy and furry then you are going to have a blast at this farm. When you get bored of the farm why not head on over to the Millwall Park for a breather and just take in the surreal peace and quiet of the environment. It makes for a refreshing day out. Poplar tube station is found in Zone 2 for those wishing to look up tube details online. The best way to navigate your way around the tubes is to grab one of the handy leaflets you find in the stations. They will give you a detailed outline of the network and help you know where to disembark. You will also find the voice over systems within the trains helpful so you don’t miss your stop! 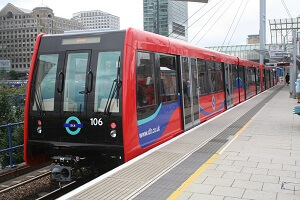 Poplar Docklands Light Railway Station has three of the six typical routes found on the Docklands Light Railway running through it. These three routes are Tower Gateway-Beckton, Stratford-Lewisham and lastly Bank-Woolwich. As a result of all this traffic, Poplar Station is always very busy. Most buses can be taken from Poplar High Street. Logging onto the tfl website will give you access to all the times and local bus services available to you. You will also find that they show you the time of the next bus service so you can rest easy knowing when the next bus arrives. Oyster cards are a common way of paying for your bus journeys and can simplify life for you as you don’t have to carry cash when you are moving around. From Poplar’s All Saints Station you can catch a bus headed towards Newby Place as well as Poplar High Street. From Poplar High Street you can make connections to other areas. Blackwell Station will take you to Preston’s road and Manchester road; while taking the bus from Cubitt Town and Island Gardens Station will get you to Manchester road, Westferry road, West India Avenue, Cabot Square, The North Colonnade as well as Upper Bank Street and Canada Square. Poplar residents love the good life and it shows in the numerous activities and shopping outlets available in the area. You never have to go far to find exactly what you are looking for in Poplar. From enjoying quality time with loved ones in Poplar’s Recreation Ground to going shopping on the High Street, Poplar has enough to keep you occupied for days. Why not play a game of tennis with a friend, or perhaps enjoy a game of football with the mates or even challenge a colleague to a game of badminton. Whatever sport you play whether it is basketball, netball, cricket, softball or indeed just enjoy throwing a Frisbee, you can find partners to play with at Poplar’s Recreation Ground. Poplar has at least 40 different restaurants to choose from. Each one is unique in its own right and caters to a particular need. You will find Oriental food (Japanese, Indian, Chinese) Spanish, Italian and local British cuisine. There are so many different options for you to enjoy and depending on the occasion you can find the right restaurant for you. If you are coming off the tube and need a great place to eat from that is within walking distance then be sure to check out any of the following places below. Oriental restaurants such as Shukran and Sichuan Kitchen are just some of the casual dining eating places that dominate the Poplar food market. These eating houses have a contemporary modern feel about them which is aesthetically enhanced by the interior decor accompanying each. Oriental restaurant Feng Sushi for all your sushi needs – indulge yourself and your family in a traditional sushi platter as you savour the Japanese delectable cuisine. Or perhaps you are more the Italian kind and prefer a simple plate of pasta? Well head on over to Strada, where all your pasta cravings will be satisfied to a T. Maureen’s found on Chrisp Street is a local favourite as well. If however you lean more towards Spanish cuisine don’t feel left out as Levante is right alongside and will deliver a superior and unrivalled experience. If you want Chinese cuisine then be on the lookout for Noodle Street, New Wings and the Super Three Chinese Restaurant. For Indian cuisine look for The Tale of India, Spice Merchants, Poplar Spice, Raka, and Ravaa restaurants. If you want to try out another Italian restaurant make your way to Il Bianco. If however you want something that is radically different, head out to Ayanna’s for some Caribbean style cuisine. If all you want and need is a place to hang out and have an ice cold number with the mates then check out Manhattan Grill which is both a Restaurant and a Bar. Kill two birds with one stone as you enjoy a fantastic meal accompanied by a drink. Another great restaurant and bar to look out for is Brodie’s Waterside Restaurant & Bar. Brodie’s offers an online booking platform for those who may wish to make a remote booking ahead of time. The Manor Arms is a drinks only pub that will set you back about £20 for two rounds of booze. Situated on East India Dock Road, the pub is a regular spot for local residents. The Gun, located at 27 Coldharbour is a posh pub that also offers British cuisine and seafood if you wan to grab a bite while you enjoy your drink. Callashann’s on Chrisp Street is another stellar British pub where you can enjoy your beer in peace. If all you want is a bar without food then Hopes & Anchor will give you great value for your money as well as an awesome experience. Royal Charlie doesn’t do a bad job either. You really are spoilt for choice in Poplar bars. There are more than 60 primary schools to choose from in this area alone! This is not to say that these are the only secondary schools available. There are lots more that fall under the independent schools list. There are over 20 different schools based on religion and other beliefs that parents can choose from to send their children to. Institutions of higher learning in Poplar include East London Arts & Music School as well as Tower Hamlets’ College. There are sadly no universities within Poplar though there are others within bussing and commuting distance. If you are looking for medical assistance in Poplar, then Chrisp Street Health Centre is one of the best options around. Chrisp Street Health Centre is run as a general medical practice in East London. Staffed by several proficient doctors, nurses, and other health care providers, you will be able to receive the necessary assistance you require from simple vaccines to blood tests. If you are a UK resident you are entitled to free healthcare in government hospitals and health clinics provided and covered by the National Health Service (NHS). If you are a visitor passing through however, you will be required to pay for your hospital bills. This is why it is greatly encouraged and advised to seek travel insurance before visiting England. If however you come from a European country you will be required to carry only your European Health Insurance Card. With this card you will be eligible to receive treatment from NHS hospitals free of charge. Failure to show this card however might mean having to pay for your treatment. If you are looking for a property in Poplar do not hesitate to call our local office.